A pilot program encouraging older adults to get walking to improve their health has revealed unexpected details to researchers at UBC’s Okanagan campus. Charlotte Jones, a professor with the Southern Medical Program based at UBC Okanagan, introduced a program called Walk and Talk for your Life four years ago. The program was developed at the request of, and in collaboration with, more than 300 low-income older adults. 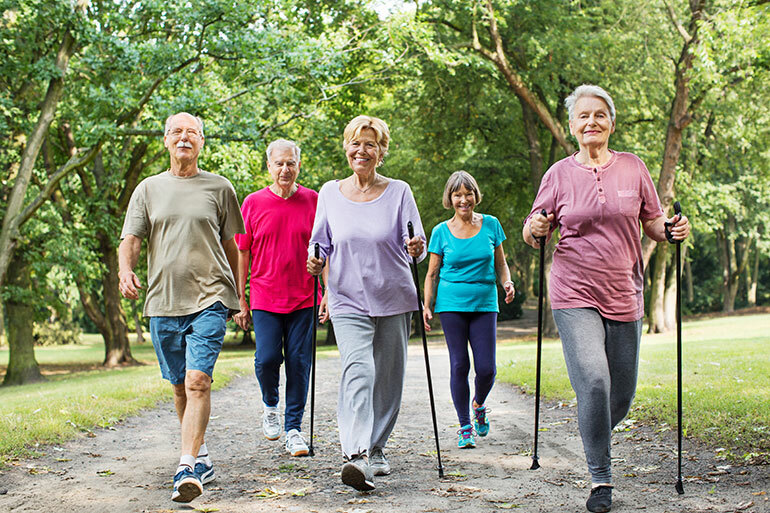 The community-based program, offered to seniors at a variety of residences, introduced walking and exercising programs that encouraged companionship. While established to help keep seniors active, the primary goal was to combat loneliness and isolation and to improve fitness among older adults, explains Jones. “Multiple studies have demonstrated that people who are lonely and socially isolated are at higher risk for a number of psychosocial and physical disorders including dementia, depression, physical decline, falls, hospitalization and premature mortality,” says Jones. As Canada’s population ages, the issue of isolated seniors has mushroomed. Jones says each year more seniors are living alone, and this has inspired caregivers to solve the issue of secluded seniors. Jones has since held several different Walk and Talk programs, with different themes, involving more than 200 elderly people. Free to all participants, the program emphasises socialization and maintaining or improving functional fitness. While the programs have been successful with many participants reporting feeling healthier, the researchers became aware of a new dimension. According to a 2015 Canadian Health Measures Survey, 78 per cent of adults aged 60 to 79 years have measured hearing loss, and more than 77 per cent of those have undiagnosed hearing loss. While hearing aids and auditory rehabilitation may help combat isolation, Jones says it does not address declines in functional fitness like gait speed, musculoskeletal decline and increased risk for falls. This opened another avenue of research for Jones and her team. Students from the Southern Medical Program, the School of Health and Exercise Sciences, School of Social Work, and psychology, biology and microbiology departments held a series of one-on-one interviews with seniors who had a self-reported hearing loss. These participants identified several aspects of the program that could be adapted so the program would address their hearing-loss needs. The next step was the Walk, Talk and Listen study that included exercise, socialization and auditory rehabilitation in a more conducive acoustic setting. This second pilot project involved seniors with self-identified hearing loss who participated in group exercise classes at the local YMCA along with auditory rehabilitation which included education about hearing loss, hearing technology and improved communication skills. The big takeaway, says Jones, is to remember to tailor all physical activity interactions for the target audience, in this case, people with hearing loss. Jones’s research was recently published in the Aging and Mental Health journal.